FIRST METRO SECURITIES BROKERAGE CORPORATION is a stockbrokerage house licensed to trade in the Philippine Stock Exchange. Our strong expertise in the stock market is backed by the strength and stability of FIRST METRO INVESTMENT CORPORATION, the leading investment bank in the country, and the METROBANK GROUP, one the Philippines' largest financial conglomerate. We provide our clients with easy and convenient access to the listed securities in the stock market, either thru our state-of-the-art online trading platforms or with the assistance of our seasoned and knowledgeable equity brokers. Our strategic alliances with highly regarded local and international economic and market research providers give our clients access to superior and reliable economic and market information, analysis and recommendation. We are the market maker and one of the authorized participants of the country’s first and only Exchange-Traded Fund (ETF), the FIRST METRO PHILIPPINE EQUITY EXCHANGE TRADED FUND (FMETF), which tracks the performance of the PSE Index. FIRST METRO INVESTMENT CORPORATION is the investment banking arm of the Metrobank Group. With over 50 years of service in the development of the country’s capital markets, First Metro Investment solves its clients’ greatest challenges and meet their most pressing needs. Armed with an in-depth understanding of the domestic capital markets and formidable distribution capabilities, First Metro Investment delivers best-in-class investment banking and financial related services to a diverse client base that includes public and private corporations, other financial institutions, high net-worth individuals and the public sector. First Metro Investment and its subsidiaries offer a wide range of services, from debt and equity underwriting, loan syndication, project finance, financial advisory, securitization, investment advisory, government securities and corporate debt trading, equity brokering, asset management, online trading, fund management and research. First Metro Investment asserts its dominant position in the industry as it continues to take the lion’s share in all transactions in the domestic capital market. METROPOLITAN BANK AND TRUST COMPANY is a leading financial conglomerate with diversified business portfolio including: investment banking, thrift banking, leasing and financing, bancassurance, and credit cards. It offers full range banking and other financial products and services, including corporate, commercial and consumer banking, as well as credit card, remittances, leasing, investment banking and trust banking. Founded in 1962, Metrobank has since become the premier universal bank and among the foremost financial institutions in the Philippines. It has maintained leadership position in various market segments with better client coverage and accessibility. Metrobank currently spans a consolidated network of over 1,950 ATMs nationwide; over 860 domestic branches; and 31 foreign branches, subsidiaries, and representative offices. Metrobank’s success lies in its strong franchise and the synergy of the Group. This has been instrumental in promoting our cross-selling efforts and deepening client relationship. Metrobank was upgraded to Investment Grade status by Moody’s Investors Service (Moody’s) in 2013. The Bank Financial Strength Rating (BFSR) was upgraded to Baa3. 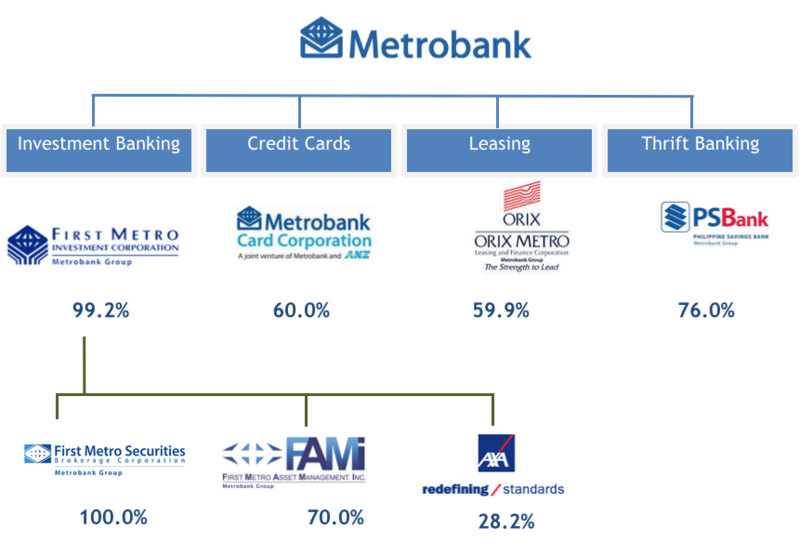 The credit rating upgrade is viewed as an affirmation and recognition that Metrobank has taken the right strategic path to sustainable growth. This upgrade sets Metrobank at par with the Republic of the Philippines and demonstrates the strength of the Metrobank franchise in the country and reflects its strong correlation to the domestic economy. At FirstMetroSec, we strive to provide our clients with easy and convenient access to the listed securities in the PSE, coupled with timely and accurate market research, as well as investor education programs. By fulfilling this mission, we hope to provide equal investment opportunities for all Filipinos. Our office is located at the 18th floor PSBank Center, 777 Paseo de Roxas Ave. corner Sedeño St., Makati City 1226. 2015 © All Rights Reserved. First Metro Securities Brokerage Corporation.